Started working on this about the time the site went down. Model is more or less done, getting into the electrics now and blind as a bat, first timer with RC! Doug at Dumas has been helpful to me and I will be talking to him again. 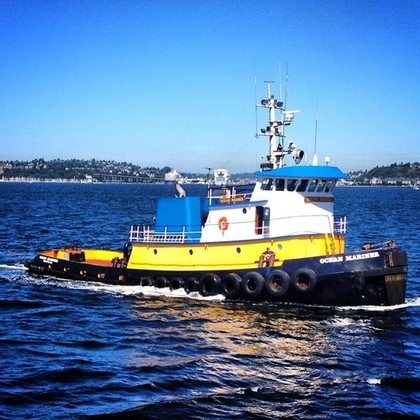 I did it up in Western Towboat (Seattle, WA) colors and not Moran, made a few changes along the way like adding a tow winch, omitted a couple things etc. She looks a bit like a tug WTB used to own called the Ocean Mariner, an ex-YTB, on which I made many trips to Alaska and as far south as San Diego. I have been taking pix along the way and will share them here when the site is all working again. Re: DUMAS Carol Moran kit in the building process. Perhaps post the photos on the RC Groups site - I find it easier, just post the link to them there. Also catches another group of builders there. which is on the www.tugboatinformation.com site. Here goes. . .
Looks good Meechingman. I'll see if it uploads alright. 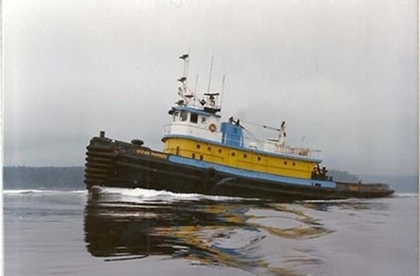 The photo credit, from the tugboatinformation.com site, is Dave Miner. I sailed on both those boats at times. I was Mate on a lumber barge run on the coast for a time with the newer version. The older one, the YTB was the first boat of theirs I worked on in 1981. We went up to the Bering Sea on it with a load of stuff for a little town called Kipnuk. Got in a hellish blow off the coast up there and the little river tug who was supposed to take the barge off of us to take it upriver came out against our Capt's advice as it was quite rough and blowing over 60. Well they decided to come out anyway and sunk with the loss of 4 guys if I recall. We had to run up to Nunivak Island and layed there for about 3 days until the storm blew over. Then the Husky II pilot boat came out and took the barge and we ran home light. We were 34 days on that trip, so I got to know that boat pretty well. Oh and BTW, I went and dragged out my pix and that pic of the older boat that gives photo credit to Dave Miner who worked there at that time is actually a picture I took. WTB had all their boats involved in the putting in place the new Hood Canal bridge and on the way up or back, me and the owner skipper, Bob Shrewsbury Jr, got in the Zodiac and ran around taking pix of the fleet underway. Much fun! I have tried several times to contact that tug site but always get back an undeliverable message. There is several things they have wrong or incomplete on there. It must have been great to work on these boats tugs have always fascinated me. My pal used to work for the Rea towing company on the river Mersey in the sixties on the "Rosegarth" a model of which I will be building later in the year (that's if I ever get the Sun XX1 and the Tid finished, seems to be taking forever). Love th stories and the pic's keep them coming. Rosegarth looks a bit like the Furie which I was getting close to ordering but am now leaning towards the Assurance Class Rescue Tug from Slipway. Working on tugs is like most things, it always looks great from the beach, or the other side of the fence if you will. Its lots of boredom, menial tasks and labor, lack of sleep, gone from home a lot, punctuated with moments of sheer terror. But of course there is fun times too. When you get a group of guys on the boat that get along, its great, but nothing worse than being on a boat where nobody likes anybody else, its just miserable. Sounds a bit like being an Airborne soldier and brings back memories of my time in The Paras, happy days and all part of the job. Nothing as harrowing as that I am sure! The boat is almost complete, just doing a few finishing touches. Had it wet in the tub, for ballasting and operations check. It floats and it works. Hope to put it in bigger water soon and will post some pics of the build and trials when and if the site starts working again. Had it in the water twice now, looks good underway. Speedy like most of these models but looks right scale wise as to wake, etc. A little drip from the stuffing box (grease tube), not much. Have some video of it and some stills. Having trouble getting my vids to upload at Photobucket for some reason, only got one to load there and its not worth putting up here, even if I could figure out how! Hopefully when everything gets ironed out I can get some pics here of it. It was a fun build and it looks good. Here then is a quick vid of it in the water underway. Took some time to get it uploaded to Photobucket. Its short only 33 secs but if you set your player to slow, it lasts a little longer and looks a bit more realistic. I hope it posts OK. When they get the pic thing figured out here I can post build pix if anyone wants to see them. Here is a nice still of her at rest. Here is your picture of her at rest.